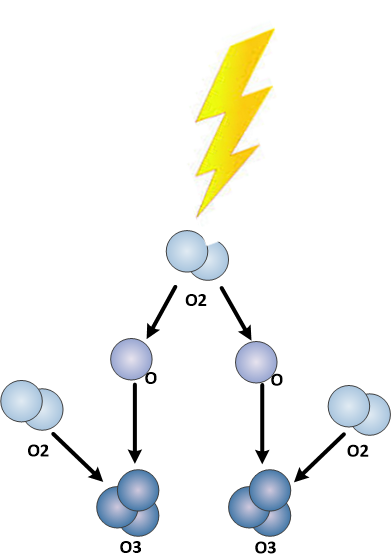 Some ozone generators produce ozone directly from ambient air by blowing air past a corona discharge dielectric or UV light. These ozone generators are used for air treatment, odor removal, or mold restoration applications. 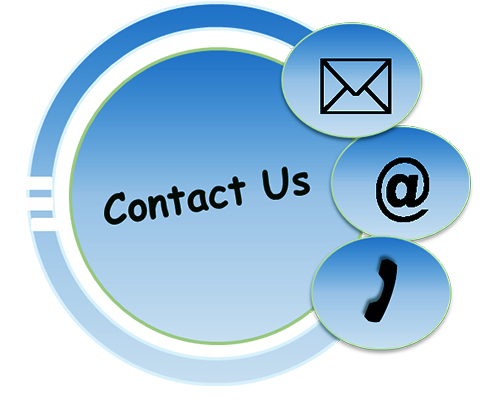 This article will refer to these ozone generators are Commercial Ozone Generators. Ozone production from these commercial ozone generators is almost always measured in mg/hr. Therefore we will use only this unit of measure for ozone production calculations. To determine the mg/hr of ozone from an ozone generator we must determine the milligrams of ozone that are produced in a given hour period of time. This is done by determining the air flow-rate through the ozone generator and the concentration of ozone in that gas. 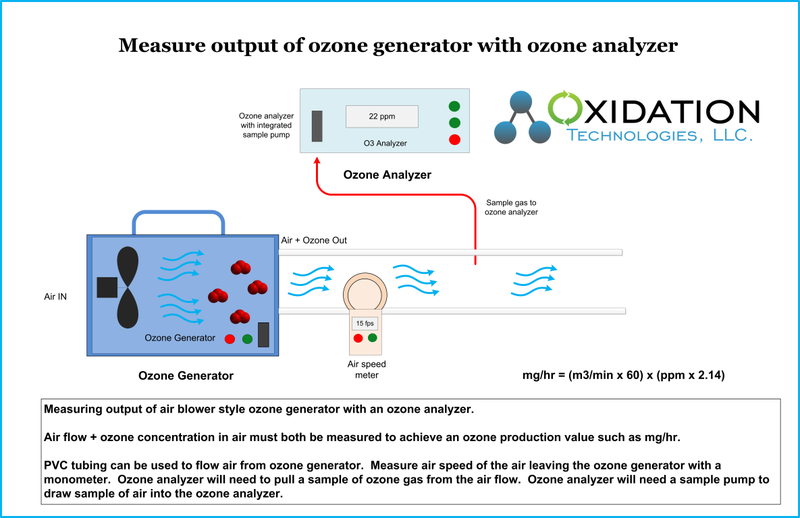 Concentration of ozone is normally measured in ppm for these ozone generators due to the relatively low concentration of ozone and overall accuracy of devices available. An ozone meter will be required to measure ozone concentration in the air leaving the ozone generator. This must have a sample pump to draw a sample of gas from your flow tube into the monitoring device. This will provide the most accurate ozone measurements without disrupting your air flow. Ideally a UV based ozone analzyer will be used to measure ozone levels due the greater precision and accuracy available. 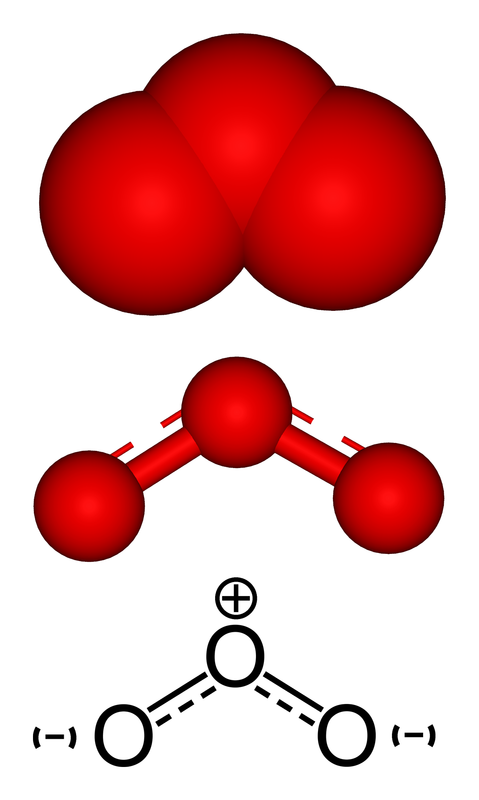 However, there are some ozone meters available using electrochemical or HMOS sensor cells that can pull a gas sample into the sensor and provide reasonable accuracy. For the best accuracy in ozone production choose the most accurate ozone meter possible. The specific ozone analyzer we recommend to use for this testing is the UV-100 Ozone Analyzer. This is available for sale, or for rent for shorter term needs. A Monometeris used to measure airflow by measuring the velocity of airflow in your flow tube. A digital monometer can be obtained that will measure airflow in a variety of units of measure. For the best accuracy in ozone production choose the most accurate monometer possible. A Flow Tube must be constructed to measure airflow from the ozone generator. This tube can be constructed of PVC or other plastic materials. The airflow from the ozone generator must have as much turbulence removed as possible to accurately measure air speed. This tube must be sealed directly to the outlet of the ozone generator and must not restrict air flow in any way. Actual air flow of the ozone generator in normal operation must be obtained and measured accurately. For more information on common ozone-related units of measure click HERE. ppm = parts per million – commonly used to measure ozone concentrations in ambient air. 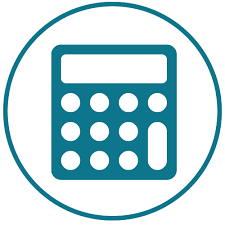 Can be measured by weight or by volume, most commonly is measured by volume, for the purpose of this article, we are using only ppm by volume.